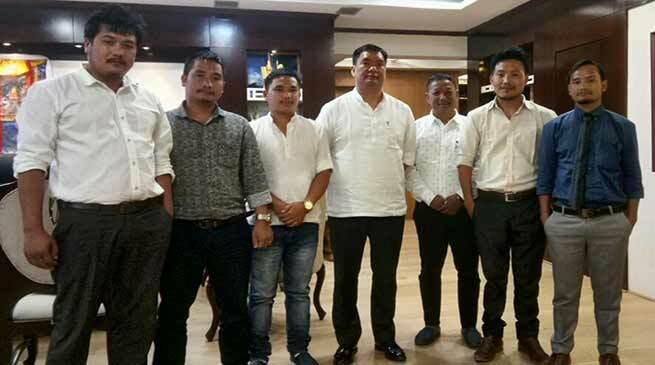 The Students Union Movement of All Arunachal (SUMAA) delegates led by its president Tagru Tame called on Chief Minister Pema Khandu this morning. SUMAA team put forth the concerns on the implementation of Tibetan Rehabilitation Policy and its consequences on indigenous tribal population. CM after giving a patient hearing reiterated that no policy or program will be implemented in the state which is detrimental or hamper the interest and rights of indigenous population. He said that there is a general misconception on TRP. Tibetan Rehabilitation Policy formulated and adopted by Government of India for all the states having Tibetan settlements is yet to be implemented in the state of Arunachal Pradesh till date. “Any policy decision taken by the state govt will keep the state’s interest paramount” he emphatically said. He assured the delegation that the TRP issue shall be broadly discussed with all stakeholders and also be taken up in the ensuing assembly session for discussion. He further sought cooperation from all stakeholders particularly the youths in facing the challenges and giving positive shapes in the interest of the state. Minister PHE, WS & IPR etc. Bamang Felix was also present in the meeting.